3 Diet At Home To Alleviate Severe Heartburn And Acid Reflux Causes! Some very serious health problems may occur as consequences of an untreated acid reflux disease, and that’s why, it is very important to detect, diagnose and treat the affection in its early stages. The acid reflux disease leads to the onset of esophagitis, characterized by inflammation, irritation and pain in the esophagus caused by the gastric acid attacking the esophageal tissues. In the case of healthy individuals, a group of muscles called the lower esophageal sphincter has the role of protecting the esophagus from the gastric contents by only opening up to let food pass from the esophagus into the stomach, and then closing back tight again; however, in the case of a patient suffering from acid reflux, these muscles are no longer able to close as tightly, and the acid leaks out into the esophagus. In the case of severe acid reflux, the esophageal lining may become scarred, effectively narrowing the esophageal passage. This medical condition (called esophageal stricture) can become severe enough to block the passage completely, thus preventing any food or water from passing through. This may further lead to the onset of a number of nutrition related affections, and as such it should be treated immediately through certain procedures which aim to enlarge and stretch the esophagus. When acid reflux causes esophagitis, the patient is exposed to the risk of developing esophageal bleeding or ulcers. Also, Barrett’s esophagus is more common in the case of acid reflux sufferers and this is an affection characterized by a discoloration of the tissues in the lower esophagus as they become more and more resistant to acid, but the modified tissues also have a higher risk of malignancy. Along with Barrett’s esophagus, severe acid reflux, smoking and alcoholism are considered to be the leading causes of esophageal cancer. The acid reflux disease can be managed through a number of lifestyle changes. Most of these are related to the individuals eating habits: for example, eating several small meals every day instead of three big ones will prevent the stomach from becoming overloaded, and thus will reduce the chances for any gastric acid to enter the esophagus. Other measures, involve both the eating and sleeping schedule: eating shortly before going to sleep may cause night-time reflux and pain; it is strongly recommended that you do not go to sleep for at least 45 minutes after having had a meal. A few measures refer only to the patient’s sleeping habits: for example, a patient affected by the acid reflux disease should be sleeping in a bed with the head elevated 6 to 8 inches, in order to help keep the gastric contents down. Your personal physician can offer you more advice regarding prevention and treatment methods for your acid reflux disease. It is best that you closely follow his indications in order to treat your affection and prevent any of the possible complications. There are times that after a splurge on a large pizzas and a couple of beer mugs, you get this burning sensation in your chest and throat. 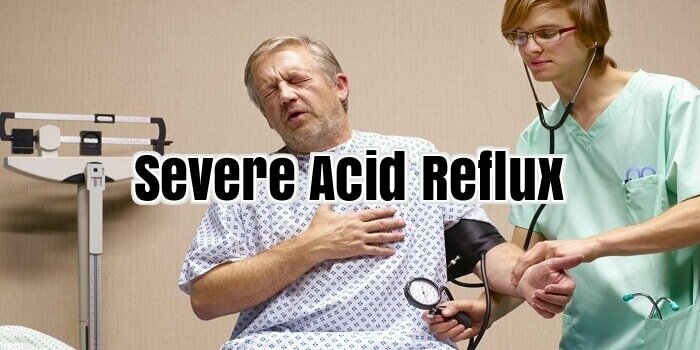 You got heartburn, a sign of acid reflux disease. Gastroesophageal reflux disease or GERD is commonly referred to as acid reflux or heartburn (which is actually its symptom). This affliction attacks almost everyone regardless of age and gender. In fact, as you are reading this now, millions of Americans are suffering heartburn or several other symptoms of acid reflux disease. GERD or gastroesophageal reflux disease occurs to millions of Americans as a chronic condition that some even suffer this attack at an average of three times a week, while some have it almost daily. Symptoms of acid reflux disease could differ from one sufferer to another while others do not even know they are having it. There is this interesting article that wrote about cases where the patient was totally clueless about his condition until his dentist told him about it. What gave his dentist the idea was the way the patient’s teeth erode due to acid that were apparently refluxed or regurgitated from his stomach. While some would say that the patient in the above case is luckier, he does not have to suffer the discomfort and pain associated with heartburn, the clueless patient may be more susceptible to a later surprise of more severe complications. Remember, detection is important as the first step towards resolving a problem or ailment. Chronic acid reflux disease that goes on for more than four years could lead to severe complications. The sensitive cells lining the esophagus could be irritated and damaged due to constant exposure to stomach acid that flows back from the stomach. Failure to detect and resolve this condition could lead to a more serious problem that could become a precursor to cancer. There are a lot of factors and triggers that lead to the development of acid reflux disease. This includes physiological conditions like hiatal hernia, inability of the stomach to empty it, etc. One of the primary triggers of a heartburn episode is the foods ingested. For several reasons, some people are just more sensitive to acidic foods that after eating them, heartburn occurs. Alcoholic and carbonated beverages, spicy foods and foods with high fat content are also major triggers of heartburn. There are a lot of talks about stress contributing to the development of acid reflux disease by it has not been really directly linked to it in purely medical terms. However, stress is usually ascribed to as a secondary factor in the development of gastroesophageal reflux disease. The best way to fully ascertain your triggers is to try to maintain a dairy diary of what you ate, what you did, etc. and along the same row, you can indicate if you had an episode of heartburn. Better yet, discuss this plan with your doctor who would be more than glad to help you better understand your acid reflux disease. Diet At Home To Alleviate Severe Heartburn And Acid Reflux Causes! Following a strict acid reflux food regime at home can be a very effective diet approach by keeping clear of some typical mild and severe heartburn causes. This is because based on expert opinions, “bad” foods are among the most prevalent of causal factors. One must realise that this condition occurs during digestion, when there is a burning sensation in one’s chest / throat caused by acid pushed back from the stomach into the esophagus through lower esophageal sphincter (LES). If one’s LES (a valve between the stomach and the esophagus) is weakened or too much acidic food contents are processed by one’s stomach, this push-back (and hence mild / severe heartburn) will occur more frequently. As such, we can put together an effective acid reflux food regime benefiting everyone at home; such a diet will focus on avoiding “bad” foods with high acidity content or LES-relaxing foods. Additionally, instead of gulping down three large meals, please consider eating slowly along with more frequent albeit smaller portioned meals since this can help prevent excessive stomach acidity thus minimising severe heartburn occurrences. You can find additional diet examples with other unsuitable acid reflux food types through online research. While researching, you may also come across some excellent web resources outlining other ways to stop mild and severe heartburn (including GERD). Some of these methods are unorthodox – for instance, there is one offering fast relief using safe, tasty and inexpensive ingredients easily available in one’s own kitchen cupboards or pantry! By implementing these online treatment methods along with dieting at home using an acid reflux food regime, you can succeed in your relief efforts by mitigating most causes of mild or severe heartburn.